This is a quick recognition guide to the different Eagle models, based on their leg pods. 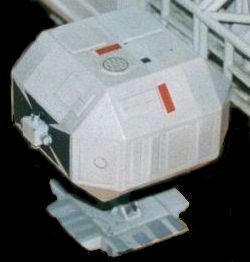 Each were detailed with different kit parts and plasticard rectangles. The first and third 44" Eagle, and first 22" Eagle, have the most similar patterns. 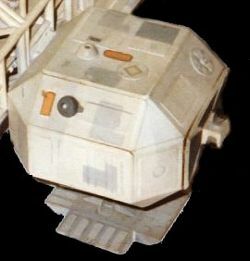 Note that these leg pods were frequently removed for cleaning and restoration during the series, and put back together in different positions. 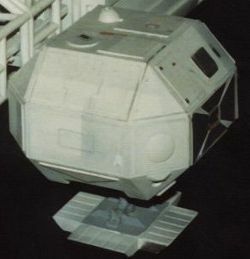 While the passenger modules could be swapped, the leg pods from one model did not fit the other models. 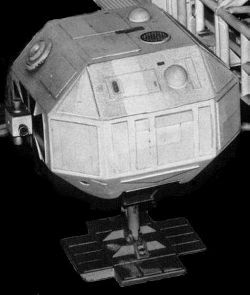 Other details are also different: the second 44" Eagle nose cone has a flattened top, and the girderwork and proportions of the third 44" Eagle are distinctive (it is made from steel, not brass). 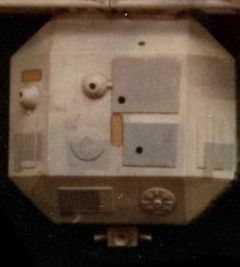 Side sloping panel: circular panel with 4 smaller circles within (from the Airfix Saturn V kit, Apollo Service Module adapter section). Top and front sloping panel: Two small cones (Revell Gemini kit retro rockets). The second Eagle only has the cone on top (on the inside, not the outside position). The third Eagle and second 22" Eagle have simple hemispheres in the same locations. Front side top panel: three vertical rectangles (all the others have a horizontal rectangle). Front side centre panel: a large rectangle with central panel (all the others have vertical rectangles). The foot pads are slightly narrower than the first model. Side sloping panel: two concentric rings (from a tank wheel). Top and front sloping panel: Two simple hemispheres (not cones like the first Eagle). The top panel one is located on the inside side (like the second Eagle). The feet have different numbers of rectangular panels. 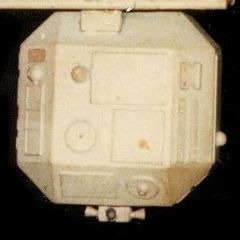 There are 14 on each landing foot for Eagle 3; Eagles 1 and 2 have 20. (On Eagle 1 these are vinyl Sasco Year Planner stickers, also used on Moonbase Alpha; on Eagle 2 they are styrene rectangles). 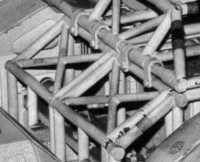 The spine is held to the cages with an "L" shaped brace. The spine is held to the cages with an "U" shaped brace. Side sloping panel: a simple rectangle.